Remember on Monday I was over on KS Augustin’s blog? (You don’t? I blogged about it, go over there and read it already! (right after you read this post, that is.) Since Kaz did such a superb job interviewing me, I’m returning the favour today. So while I’m introducing her to a land where the rain can freeze in the air, you can read all about how she thinks westerns and sci-fis are similar. Leah writes Westerns and I write Science Fiction so you wouldn’t think there’d be much room for commonalities but, in fact, there are. I like the occasional western romance myself and there are usually two strong threads running through every story I’ve read: (1) an unshakeable sense of honour, and (2) a fight against the odds. Oh, and a really conniving villain. Okay, three things. There’s also, when you sit and think about it, quite a lot of politicking going on, and many an obstacle has been overcome by an alliance or a deal made between two parties who were more than a little antagonistic at the beginning of the tale. So, now that I hope I have your interest piqued, I’m sure you’ll be able to see some few similarities in my s-f romance, IN ENEMY HANDS. The honour. Oh, the hero has it in spades. With little memory, and great courage, Srin Flerovs has little but honour and he uses it in a way you might not suspect later in the novel. A way, incidentally, that the heroine, Moon Thadin, is not too happy about. And the villains! Well, there’s Srin’s handler, a fellow scientist who’s spent the last twenty years crippling a person’s humanity rather than progressing the common good. And there’s the ultimate politician who only wants results and damn the methods. And there are the wild cards. What ever happened to Moon’s researcher, Kad Minslok? The Republic’s Security Force hasn’t found him, so does that mean he managed to escape their clutches? And what about the handsome captain of the battleship? The man who hints at his own secrets. If he’s part of the Republic, and a ship captain to boot, he must be complicit in his government’s cruelties, mustn’t he? IN ENEMY HANDS is classified as a hard s-f romance and there’s quite a bit of science in there, but it’s just another element of the story as a whole. I figure if you can cope with the romance, and the politicking, you can cope with anything! 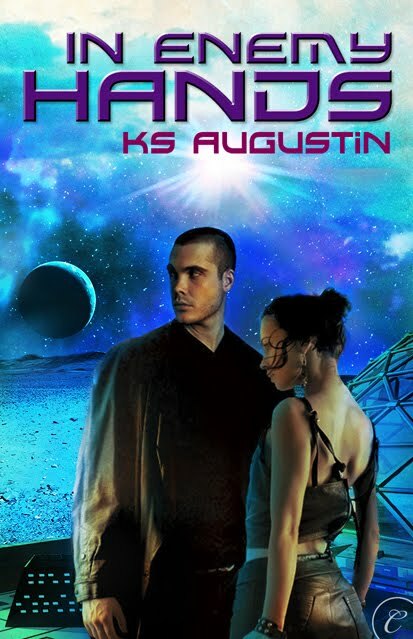 COMPETITION: I’m giving away two copies of IN ENEMY HANDS at my blog, Fusion Despatches [http://blog.ksaugustin.com]. To be in the draw, stop by and comment at the Competition post, telling me at which blog you read about my book. You have till 30 June! Wow, your book sounds fabuous!